I remember getting this recipe from my mom sitting in a booth at a pizza shop, jotting down the ingredients on some scrap paper. It was my favorite soup she made and had the best comforting effects on a cold night. She did it mostly by feel (and I do a little of the same) but gave me the directions anyway, from memory no less. The first time I made chicken soup, it made me feel like a real grown up. The first time I tasted it, I marveled how it tasted just like Mom’s. Now the recipe is safely written on a recipe card nestled in my recipe box. And today I’m sharing it with you! 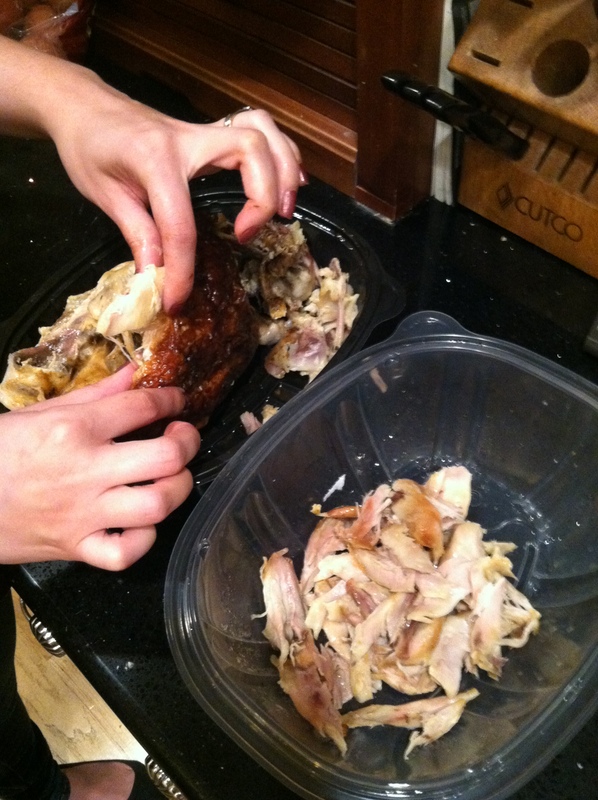 The best (and easiest) part is that you get to use a short cut and use rotisserie chicken! But if you want to go and make your own, I won’t stop you (Wonder Woman Status right there…). 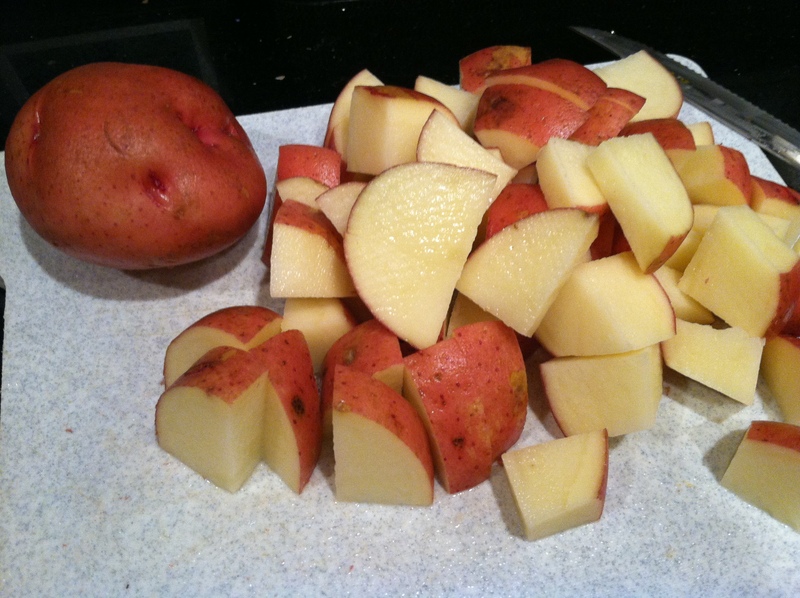 The first thing you’ll need to do is cut up the potatoes, carrots, and onion. I just learned recently that orange is a newer color for the carrot. Further reading on this says that it started in about the 17th century when farmers grew it for political purposes (the House of Orange). 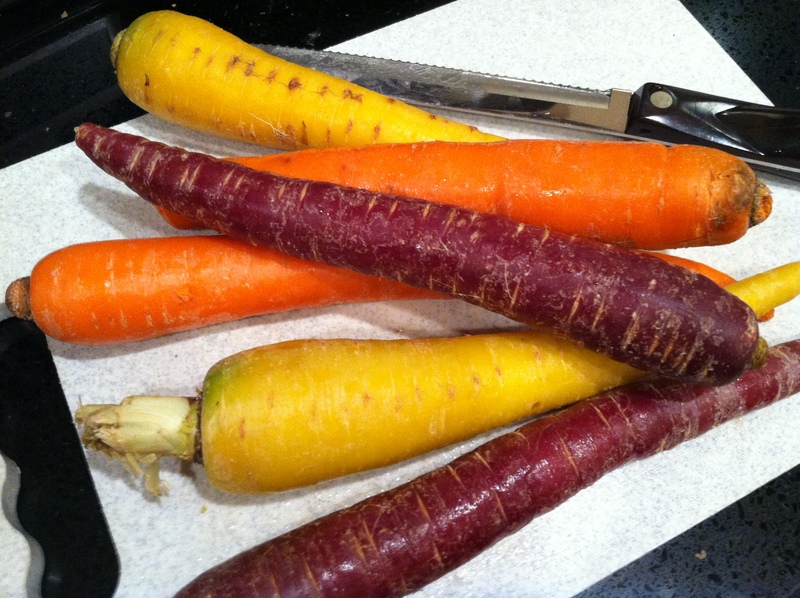 Apparently it stuck since most of us use and have access to the orange carrot, but before then it was most common to see them as purple, red, yellow, and even white. When I saw at my local grocery store that they had a bag that included yellow and purple I had to try it! 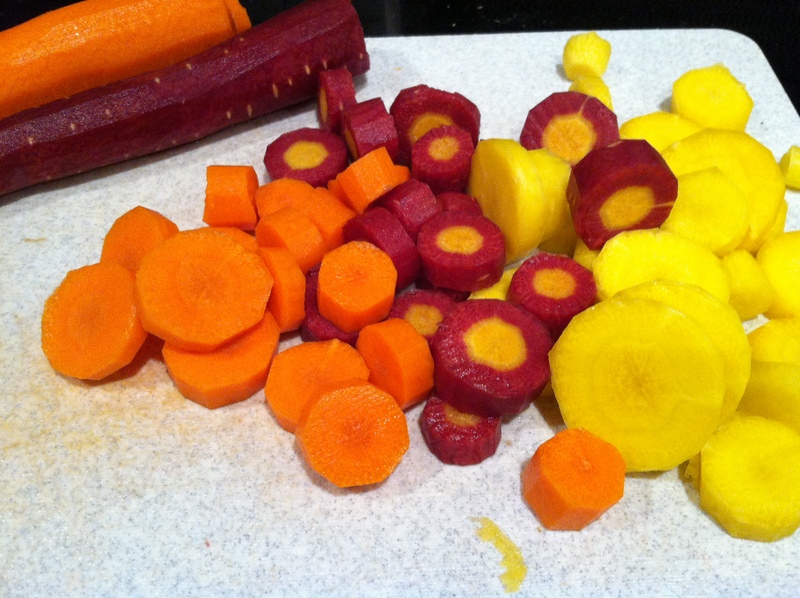 If you’re wondering if there are any differences than the orange carrot, I’d have to say that the purple carrot has a stronger “earthy” scent and taste and may have helped turn the chicken stock a darker color. Other than that, they tasted just like any carrot! 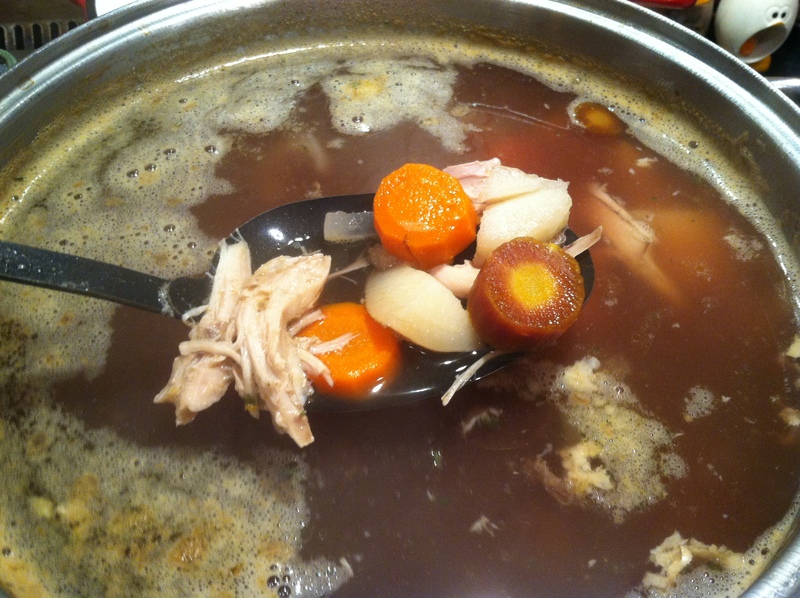 Once you’ve cut up your veggies, fill the pot with the chicken stock. Add garlic salt, onion powder, and bullion. 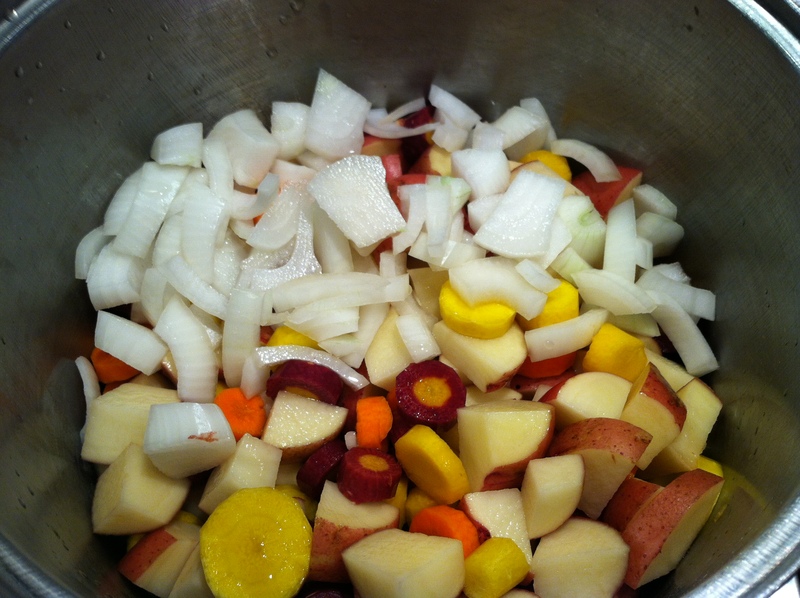 Boil until veggies are half way soft. 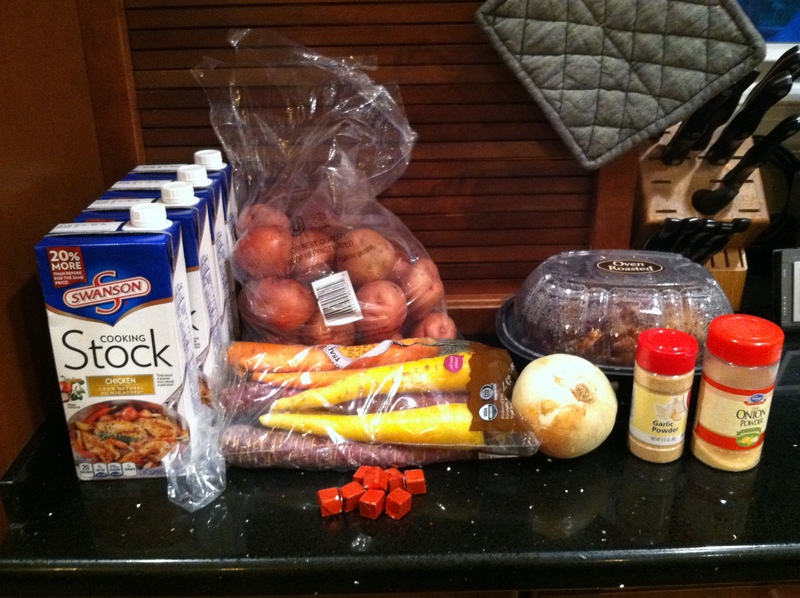 After your veggies are half way soft, then you can add your chicken. While you’re waiting for your veggies, this is a great time to break apart that chicken into pieces to throw into your soup when the veggies are ready. Next, you’ll add your basil and cook on medium heat for 45 minutes. It takes time but it’s so worth it in the end! 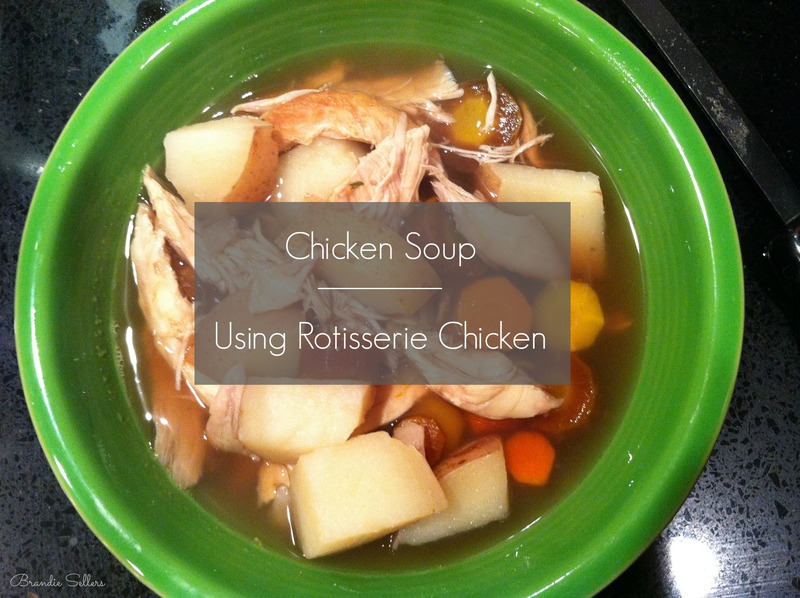 This is the best soup on dreary days and of course tastes even better the longer you let it sit. I always love this on Day 2 after making it. If you make this, let me know how you enjoy it!